According to the Bluetooth Special Interest Group, “Bluetooth” is the nickname for the project designed to unite all mobile electronic devices, just as Harald Blåtand (English: Bluetooth) had united all the warring tribes of Denmark in the Viking era. The Bluetooth logo combines the ancient runes of the letters H and B, forming the familiar symbol perched on top of every computer toolbar and phone menu. Through wireless networking, the achievements of this ancient Danish king have been brought into the modern world. Harald Gormsson Blåtand became king in 958 when his father King Gorm died. Harald’s kingdom stretched across Denmark and parts of Germany and Sweden. He also re-established Danish control over large parts of coastal Norway. Harald was baptised in 965 and was the first Scandinavian king to actively promote Christianity. The Jelling Stones have been called “the birth certificate of Denmark” because they identify the country, its king and the king’s parents. The stones were also announcements of Harald’s new faith, although he, and the other newly-converted Vikings, had difficulty fully committing to Christianity. 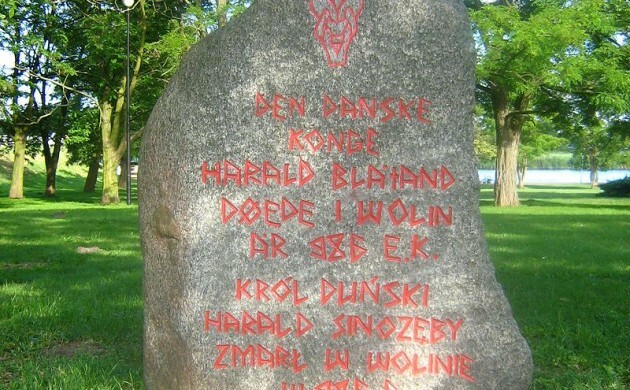 The inscription is written in runes and in Danish, not in Latin, and the text is arranged in horizontal lines instead of the haphazard manner in which runes were usually laid out. Harald had the pagan beast and serpent carved on one side of the stone, and the figure of Christ on the other. Historians dispute the idea that Harald truly converted the Danes to Christianity, offering varying historical accounts of Harald’s own conversion. Some claim it occurred under duress following a loss on the battlefield, while others say that he made the conversion of his own free will. Without disputing his sincerity, Harald must have also seen the potential of Christian doctrines and the organisation of the church to strengthen his rule and foreign policy. His relationship with the German emperor, Otto the Great, remained amicable for the most part after his conversion to Christianity, even though Danish raids into northern German territory provoked war with Otto’s successor. Harald was especially aware of the internal conflicts his conversion might create inside Denmark, which set off his programme of structural reinforcements. Harald built a network of round forts in Denmark, all following the same design. While previous Danish kings had exercised power indirectly through chieftains, Harald used these identical forts to control his kingdom directly. The planning and execution of the design points to a central planning authority with enough power to coordinate large amounts of labour and resources. Round forts were built in five strategic locations: Trelleborg in Zealand, Nonnebakken in Fyn, Fyrkat in central Jutland, Aggersborg near Limfjord, and near the city of Trelleborg in Scania in present-day Sweden. The forts were surrounded by a perfectly circular rampart with gates at each of the cardinal directions. Inside, a courtyard was divided into four areas with large houses set in a square pattern. Denmark at this time was a mix of small farming villages, defended settlements, round forts and royal centres at Jelling in Jutland and Lejre in Zealand. Towns developed slowly in the Viking Age, but under royal control in the 9th century, two large towns developed in Jutland. Ribe survives to this day on the west coast, while the second town, Hedeby, a thriving urban centre during the time of Harald Blåtand, was abandoned in 1100. A toll station and a mint for making coins have been excavated at Hedeby, as well as the remains of workshops for metal, bone, amber, glass, pottery and shipbuilding. Harald’s relatively stable rule paved the way for his son, Svein Forkbeard. Svein was a formidable warrior and led the raids on England, culminating in the conquest of the country in 1013. And if Harald Blåtand were alive today, who knows what he would think of scores of modern-day Danes walking the streets with those funny-looking earpieces that bear his name.